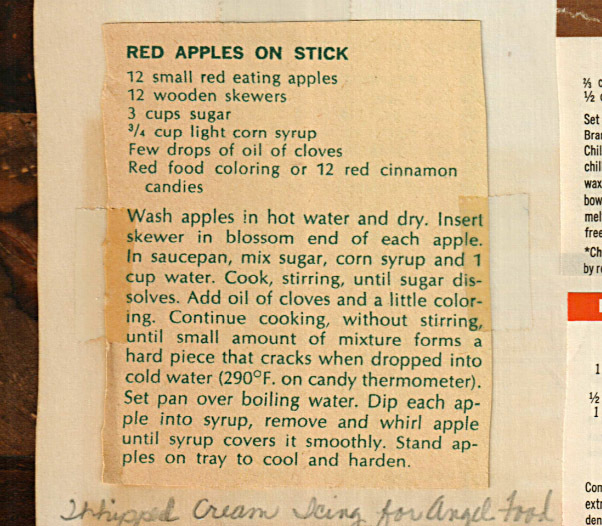 I was really excited when I found this candy apple recipe in Mom’s cookbook. After making my first batch, I was less than excited (more de–fla–ted) when I realized that I’ll need a little more practice before I become a master of the red apple makin‘. While my failed attempt at creating the ultimate delight on a stick, give this a whirl and see if you can make a go if it. 1. Wash apples in hot water, removing stems, then dry. 2. Insert skewer into the blossom end of each apple (the side of the apple opposite the stem side… a.k.a. the top). 3. In a saucepan over medium-high heat, mix sugar, corn syrup and 1 cup of water. Cook, stirring, until the sugar dissolves. 4. Add the oil of clove and a little red food coloring. 5. Continue cooking without stirring until a small amount of the mixture forms a hard piece that cracks when dropped into cold water (when it reaches 290°F on a candy thermometer). Don’t cook over 290°F! 6. Remove from heat and set pan over a larger pan of boiling water. Dip each apple into syrup, remove and swirl apple until syrup covers it completely. 7. Stand apples on a parchment covered tray to cool and harden. ♥ Scare-up the best of Halloween foodie fusion ~ Drizzle or dip melted caramel on top of the apples for a doubly-delicious creation. Did somebody say caramel? 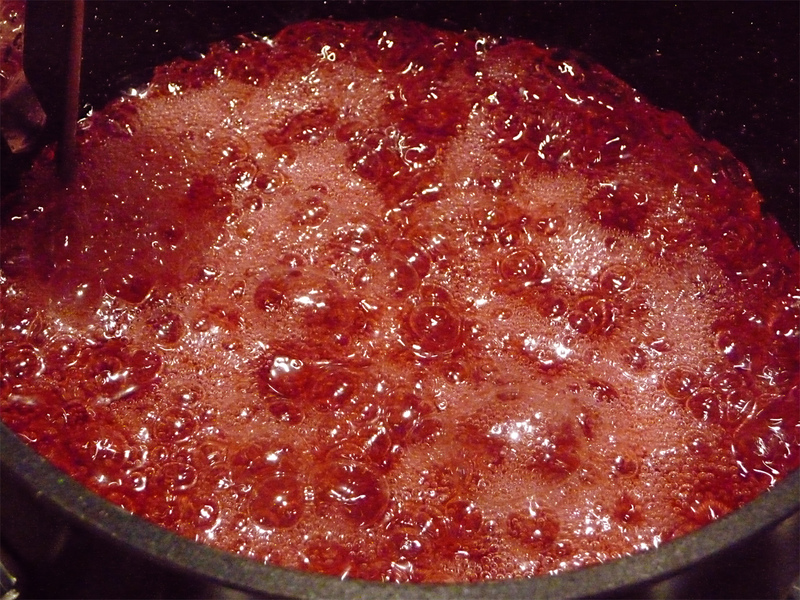 ♥ Not sure how to clean your pot of the red sugary mixture? Don’t do what I did and leave it sitting out overnight; it’ll harden into a brick. Re-melt the mixture if necessary on the stove and empty it into a plastic bag and discard. Don’t pour it down the sink unless you want to invite clogs into your home. ♥ Go fresh. Use fresh eating apples and eat them soon after making them. I made the mistake of buying my apples before I had found my oil of clove, popsicle sticks and my new candy thermometer. A week later, the apples were s-a-d, making my finished treat a little meek. 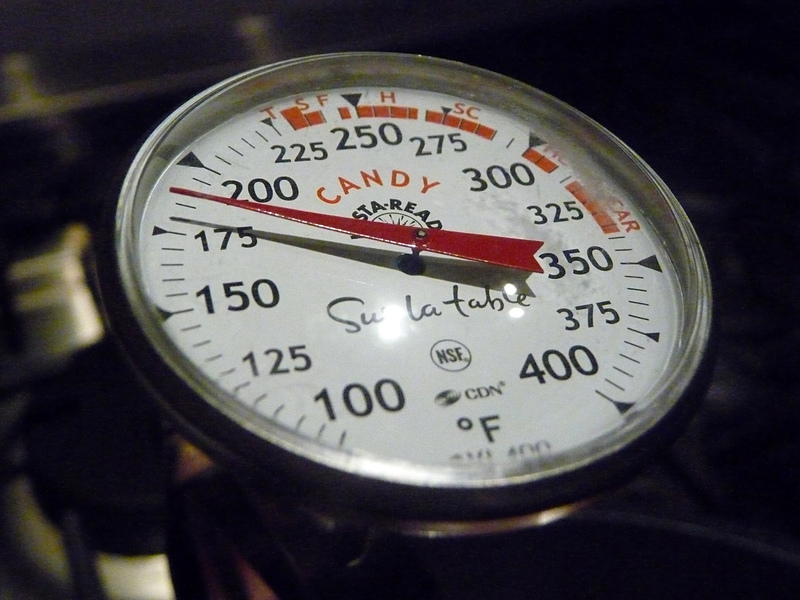 ♥ Don’t substitute your candy thermometer with a meat thermometer! The candy thermometer registers and calculates much higher temperatures than it’s meatier kissin’ cousin. ♥ I have a new appreciation for the love of candy apples. I’ll think twice about making vs. buying them next time! Truly a labor of love.